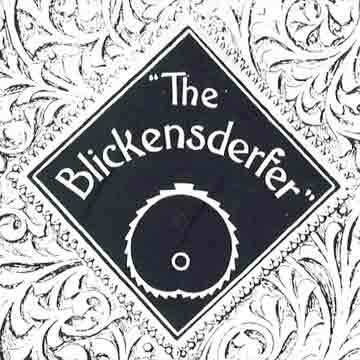 The Blickensderfer is a must-have in any serious typewriter collection. Luckily the machine is not particularly rare. However, the only machines known, are models Blickensderfer 5 and up. It was generally accepted that earlier models never came off the drawing board, because no samples of them have ever been found. However, an undated Blickensderfer trade catalog suggests otherwise. The catalog also enables us to present details of the Blickensderfers 1 and 3 on this page. The undated trade catalog may have been made for the 1893 Columbian Exhibition in Chicago where George Blickensderfer (see History/inventors) first presented his invention to the public. In the catalog the Blick 5 is compared with the Blickensderfers 1 and 3. The Blickensderfer 3 (pic 4) was a highly decorated but slimmed down version of the Blick 1, that had some of the Blick 1 features, but not for instance the Rapid Ruling Attachment, that enabled the user to draw horizontal and vertical lines on the paper. The price of the Blickensderfer 3 was 65 dollars. Finally, the catalog shows a picture of the cheap, 35-dollar Blick 5 (pic 6) which indicates that the three models were in fact available at the same time when this catalog was produced.